The search for the elusive Rowan Glace continues. It’s now turned from a past time activity into an obsessive endeavor. With the blizzard dumping 18 inches (46 centimeters) of snow in a 24 hour period, I had some time on my hands regarding indoor activities and that’s how I ended up in the attic. I still have a few closets yet to be inventoried but I became obsessed with the idea that the yarn was in the attic. This was delusional thinking since I have never put a Rubbermaid bin full of yarn in the attic since I’ve lived here. But that didn’t stop me. I folded down the attic steps and up I went. It was the middle of the blizzard and the sound of the wind was so much clearer up there. The sound of strong winds set my nerves on edge so the clarity of the sound was not comforting. In addition, the only light in the attic is in the middle of the ceiling, up high, with a 3 inch (8 centimeters) chain pull. Needless to say, I couldn’t reach it, so I was using the flashlight on my cell phone to see. What I saw were bins and bins of Rubbermaid. Some were see-through, most weren’t. My first thought was I need to take out stock in this company. My second thought, as I looked at bins stacked on bins with some stacks as tall as me, was that this was an impossible and foolish undertaking. All of the bins in the attic came from my house when I moved here. Not one bin was added– where the heck would I find room to put it– since I’d lived here. Nonetheless this sane thought didn’t stop me. Thus I began my own archeological dig through time. My allergies came on full bloom the minute I started moving the bins around. Some of what I found were clothes, books, shoes, half-finished embroidery that was set to be a fire place screen, crewel work, half finished crochet projects, the framed invitation to my wedding, wedding album, and so on. At about the fifth bin of fond mementos, I thought I’d caught sight of something white and furry out of the corner of my eye. I heard some scrabbling of nails on the floor coming from the direction where the flash of white disappeared. Now, I don’t mind field mice and with the weather the way it was outside I figured let the poor thing stay. But it did cross my mind that I had never seen a white field mouse. As I opened the seventh bin, I thought I again saw something white and furry out of the corner of my eye again only it was bigger this time. It disappeared around the corner of a stack of bins I had yet to get to. Again, the scampering sound of nails across the floor. I thought it might have been a squirrels tail, though the color didn’t match that of a squirrel. Working my way through the tenth bin the elusive creature brushed my legs. I jumped a little only to look down and see Yarn Rascal. Little one is a climber and he had climbed the steps to the attic and was having a grand old time sniffing and checking out a brand new area of the house. It was clear to me, if not to Yarn Rascal, that while he got up the steps, he wasn’t able to get down them. Nor was I able to carry him down without killing both of us. It took about 15 minutes of calling and thumping on the floor of the attic to get The Skipper’s attention. I handed a squiggling Yarn Rascal to him and told him fold up the steps so Rascal couldn’t get back up. Around bin number 16 I became tired of my little trip down memory lane and wanted to get down from the attic. Only I couldn’t. Unfolding the steps from where I was wasn’t possible. I was marooned in the attic for a good half hour before I got The Skipper’s attention and had him unfold the stairs. I have three more places to look, none of which is in an attic or basement. If I find the Rowan Glace I think I’m going to strangle it. I’ve been looking for the Rowan Glace I know is lurking somewhere in one of my stashes. Having come up empty handed I thought I’d turn the task over to the master of the stashes, Yarn Rascal. After all, he spends his entire nights not sleeping but unearthing things from the yarn vault. Lately he’s been in archeological mode. Finding and uncovering wips that I have long since forgotten about. He carefully drags them from the closet and displays them on the floor in the hallway between the bedroom and the bathroom where I can’t help but see them. Two of them have caught my interest and if I can find the yarns, beads, and patterns I was using I would love to finish them. Yarn Rascal can’t help me find the beads because he will eat them. Nor can he help me locate the patterns because he will shred them as he does yarn ball bands. Anything that’s paper, including money, must be ripped into small fragments. So last night I begged him to put his archeology hat away and find the Glace. Along with some archeological finds he unearthed a significant amount of yarn. Alas, none of it the Glace. While putting the yarns -sans ball bands- back into their respective places I realized that all the yarns Yarn Rascal had taken out were either Shetland, merino, or some other pure wool yarn. Not one was a combo of wool and silk or wool and cotton. None were cotton or linen yarns. The dog has his preferences and if it is not pure wool he ignores it. Until now I hadn’t recognized how particular he is in his choices. Unfortunately for me, Glace is a pure cotton yarn and therefore not on Yarn Rascal’s radar. That means it’s up to me to find it. I’ll give it one more week of searching and then I’ll buy a skein. All I want it for is to swatch a baby dress idea that’s been kicking around my head and because it is a spring/summer sort of thing I’d like to use cotton yarn. Why is nothing every easy? Long time, no write. I hope this is going to change. Some pesky health issues made keeping up with my blogging all but impossible. Finally I am feeling a bit better. 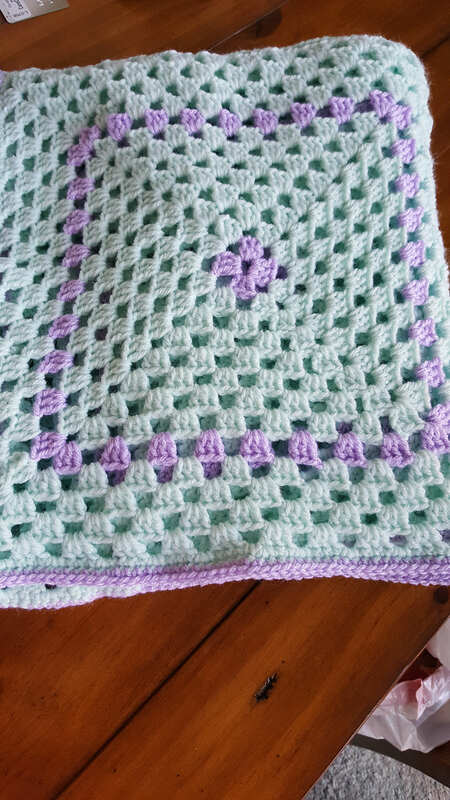 I did manage to finish the crochet baby blanket that my MIL had started before she passed away. As I said, it has been a time since I crocheted and the pattern was all in her head. I kept with the pattern blocks as she had them. The Skipper has a blanket crocheted by her and I looked to that for guidance on how to stitch the blocks together. It seems as though she liked to crochet blocks together using single crochet. Wanting this blanket to be very much still hers and not mine, I connected the baby blanket blocks in like manner. I also looked at the border on The Skippers blanket but realized I couldn’t reproduce it on the baby blanket as it would not work. While I am pretty sure my MIL’s border would have been more fancy, I decided to make the border out of single crochet. I felt this plain border would keep the emphasis on the blocks she had finished, thereby keeping the blanket as her creation. All are happy with the blanket.